So the entire racing day compressed in a little over 2 hours. Our trailer, our two boats and my bike. Operation base for the race weekend. The organizers had an interesting rule for the combined Masters races. In order to win a medal, you have to beat everybody in the heat who is in your age category and older. So for me as a Masters C rowing in a combined C/D race, it would mean I would have to win the entire heat to get a medal, but the D competitors would only have to beat the other D rowers to get one. I wasn’t sure what to expect after nearly three weeks with just some light cycling in the last week, with the heat, and with one or two quite strong competitors. 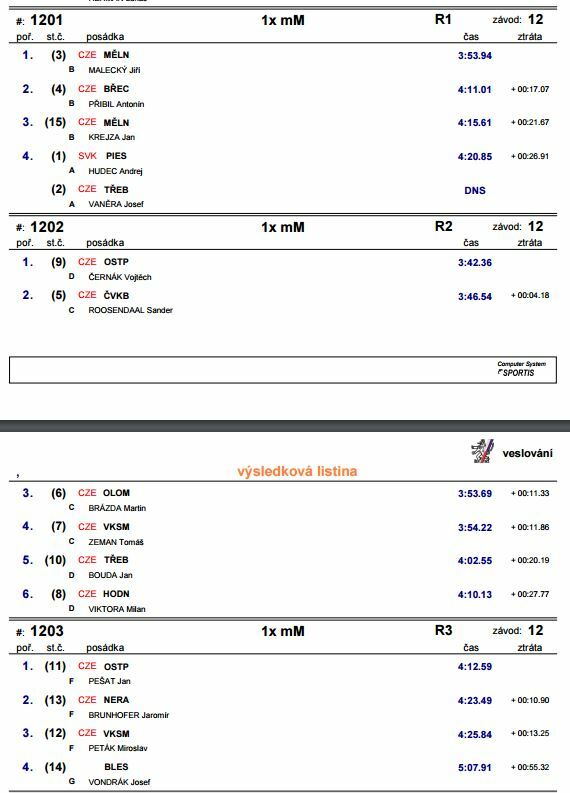 I was the last out of the start (my own fault, I wasn’t alert enough and didn’t react immediately to “go”), but quickly recovered and managed to get into second position, a length behind Mr Cernak from Ostrava (Masters D). This was not how I had hoped the race would unfold. The plan had been to use my strong and fast starts (especially on mirror flat water I am usually in front) to demotivate the others, then row a flat race for the following 900m of the course. It wasn’t to be. 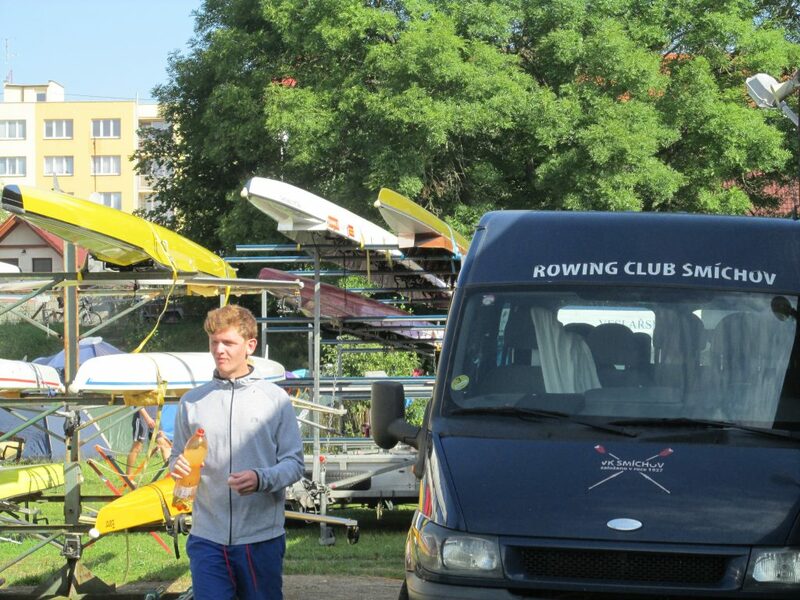 Here I was, trailing behind a “D” (and thus at risk of not getting a medal), and I had the choice between rowing my original race plan and hoping that he would fade out, or keep the rate up and risking fly-and-die. I decided to stick to my own racing plan. With 500m to go I was passing Mr Cernak but he was nowhere close to giving up. There was two lengths of light between me and the rest of the field. Spectators claim that I have been in front of him for two or three strokes, but he rated up and managed to get half a boat length back. By that time my lack of fitness was evident. My legs were hurting massively and I was seeing 1:57 split on the SpeedCoach. 1:57, which my tired brain interpreted as nearly equal to 2:00 and thus extremely slow. I tried to hang on and not rate down but I had no energy to sprint to the line. The result. Cernak (D) 1 – Roosendaal (C) 0. SpeedCoach graph of the race. I switched on the SpeedCoach before the alignment at the start. Somehow I don’t understand the readings. They don’t seem compatible with the total time of 3:46. I didn’t have a lot of time to contemplate this, because it was time to race the next race, a 500m sprint in the double with my son. We were using our boat “ORCA” but the girls were rowing their race just before ours. 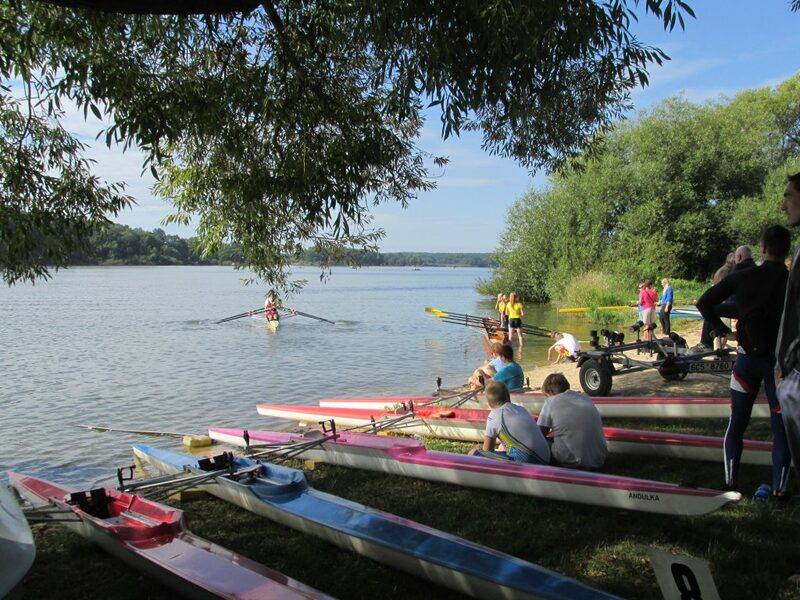 When they were done we had a few minutes to change from Big Blades to Macon sculls, adjust the footstretchers and gate heights and then sprint to the start. 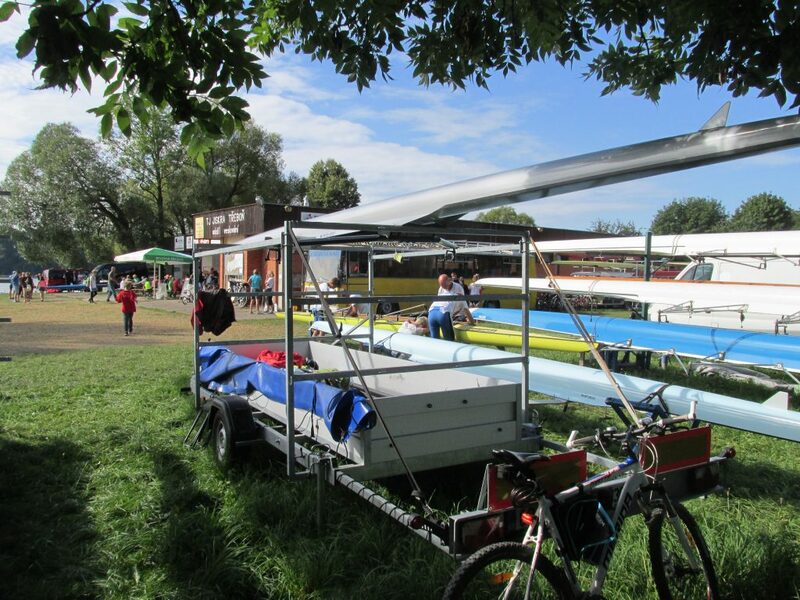 Luckily, the start of the 500m races was right in front of the rowing club, so it took us less than 2 minutes to get to the start, where the rest of the field was already waiting for us. The last race of my three races in two hours program was the Masters double. Kazi and I were expected to win this one. The only problem was that the heat and the racing was taking its toll. We launched late to avoid being exposed to the sun for too long, but in time to do a few practice sets of 10 strokes and two practice starts. As there was a lot of racing going on and the organization was slightly short of umpire launches, said launches were racing quite fast from finish to start, creating substantial random wake during the races. Kazi and I agreed that he (as the bow man) would warn by saying “wake” and then we would row with increased attention to a good and deep tap down. The race plan was simple. Start fast. Row in front. Win. Our start stroke was a disaster, probably caused by me thinking we were not aligned entirely correct (I am quite precise about that) and Kazi not expecting me to put slightly more pressure on the left blade. 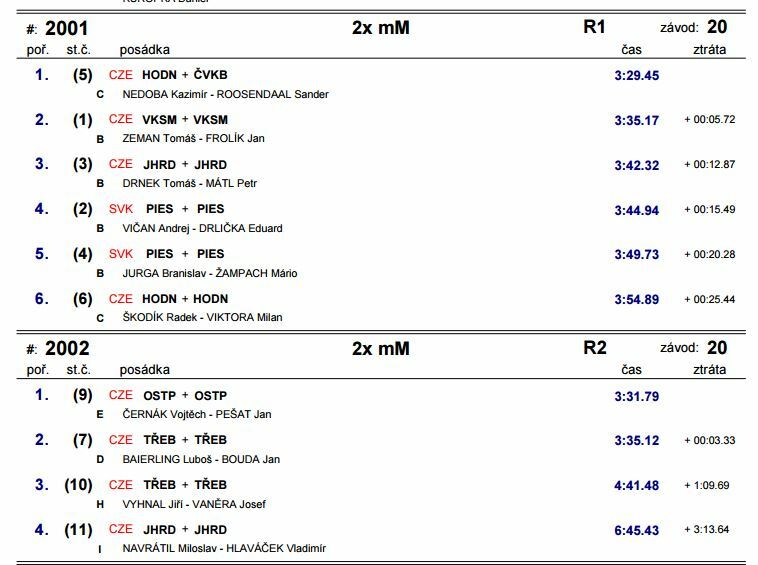 We corrected in the first 10 strokes after the start and with 900m to go we were leading the nr 2 by a length. That was a “B” category crew, by the way (as opposed to us being “C” in this combined B/C race), but due to the adrenaline I didn’t remember that at all. So we worked hard to build a lead and at the half way point we were leading by three lengths. Except that I was in much more pain than I usually am at this point in the race and I felt my strength flowing away. The sun was hammering on me. I was looking at the boat chasing us and wondering if I would be able to finish the race and keep pushing hard enough to stay in the lead. “Wake!” Kazi’s call was clear. An umpire launch had decided to start its sprint from finish line to start line. Immediately as we passed it, it slowed down to reduce wake until our race had passed. Tap down. Tap down. Wake. Tap down. OK. So we almost got stopped by the third wave which was a huge one. We lost two or three strokes of rowing and a lot of speed. Suddenly, our lead was reduced to just over a length. Usually, you wait until the wake hits the boats in the other lanes and everything is fine (or better than before if you manage to row through the wake better than the competition). But this time it was a very local wake and our competition in lane 1 was in the clear zone all the time. So we were no only a bit over a length ahead of them. I was in big trouble so I wasn’t going to sprint the last 300m or try anything else to build out the lead again. The only option was to continue and hope that good technique and rowing as hard as we could would be enough to secure the win. I admit that with 200m to go I let out the Masters rowing equivalent of a Monica Seles grunt. With 100m to go I did a Maria Sharapova grunt. And we won. 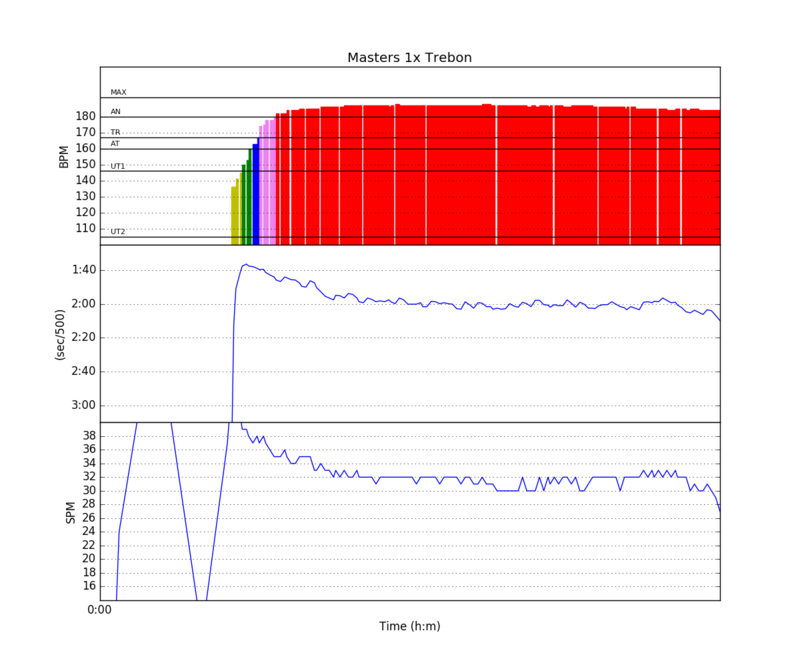 Rowing the fastest Masters 2x time of the day. Beating a couple of “B” rowers (who thus didn’t get a medal). Despite a massive wake that in the end only affected us in lane 5 and the boat in lane 6, and none of the other boats. 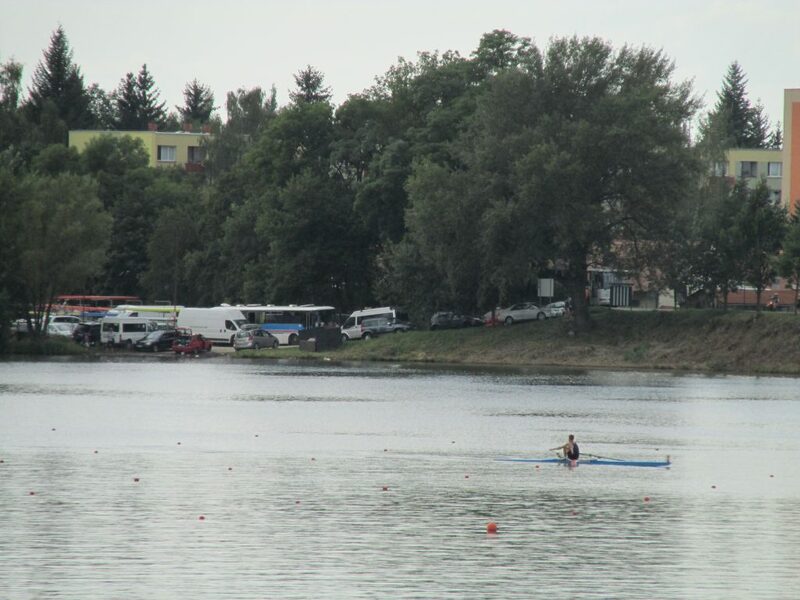 On adrenaline I managed to be quite composed during the medal ceremony and to row back to the dock very slowly. But after that it went downhill very rapidly. Despite a cool shower and drinking lots of water, I wasn’t able to do very much except sit in the shade and stare at the racing going on. 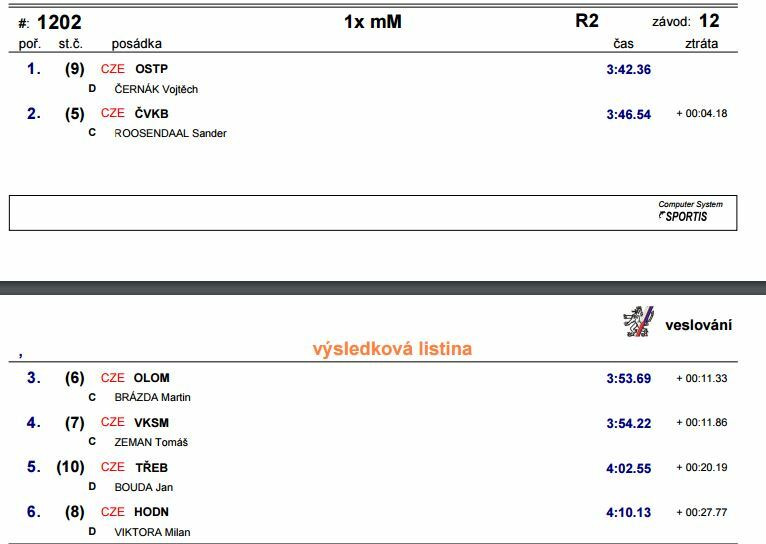 In other family members races, Lenka and her partner Iva rowed a nice race in the quad and a disastrous heat in the double. Launching much too early in the heat, combined with a slightly delayed program, they spent more than 45 minutes in the burning sun and didn’t qualify for Sunday’s A finals. They would row in “B”. In the evening, we broke up our tent (because rain was predicted) and moved to a rented room. All of that I had to do very slowly, taking lots of breaks, and drink a lot of water and sports drinks. It was really an exhausting day.